Now that my 1986 Kawasaki Concours has been repaired over the last two years to the point of becoming a reliable commuter vehicle, I’ve been riding it to work almost constantly for the last two months. This always makes an enjoyable experience out of the normal slog of going to and from work. Not only can I navigate traffic more effectively, but it also brings a big grin to my face every time I accelerate. You might say this makes commuting almost an adventure. Little did I know how true this would come to be. Yesterday, I rode into work like normal. No fuss, everything was working well. Took a little ride at lunch to do some errands, great! Then the ride home. I was running late from work already, pushing close to the 6 o’clock hour as it was. Traffic was light and I tooled through the side roads enjoying the warm weather we suddenly had attained. As I pulled onto the main through-town highway that brings me home, I gave the throttle a sharp twist to get up to speed. 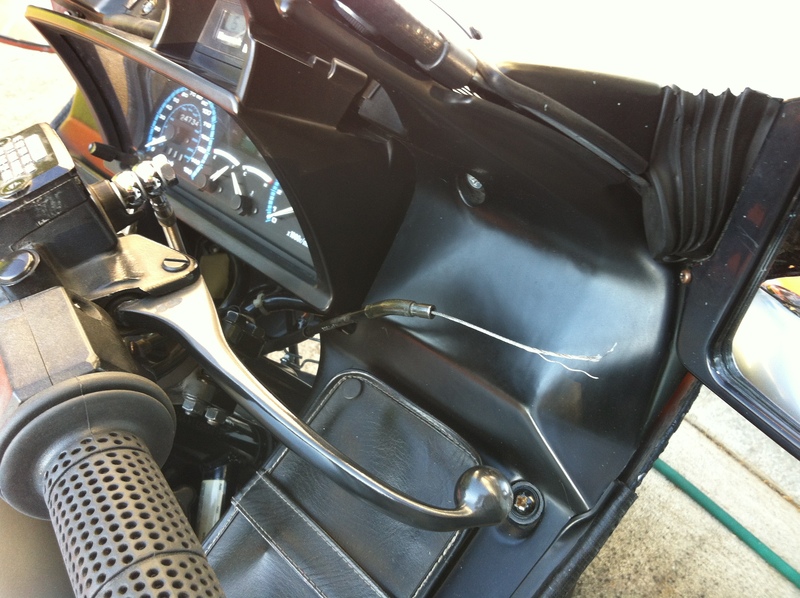 The bike started to accelerate and then quickly decelerated, leaving me with a limp throttle. Oh hell…throttle cable snapped! I managed to nurse it at an idle, in gear, into a convenient driveway and parking lot. Once off the bike I assessed the situation. The cable had broken up next to the throttle itself and not down near the carbs. What to do? I had no trailer at home, though a way to tow one if I had. Should I rent one? Call in a favor? Time ticked away as I thought through my options. I gave my wife a call and said the cable had broken and that I would try and limp it home, though I didn’t know how long it would take. (Read: don’t worry and go on with your evening). Looking at the bike again, my eyes glanced over the choke. Hmm, that might work out for part of it. Next I saw the bare end of the cable where I had pulled it broken out of the throttle itself. That looks long enough to grab onto, and apparently I’m crazy enough to try. I waited another 15 minutes or so for the traffic to die down a bit more on the highway, then I tried my hack. Pushing the choke up to almost full the engine raced. I pulled out of the parking lot slowly, with 1st gear almost killing the engine as I let the clutch out. This was going to need more of step 2, which involved me resting my arm on the right bar and grabbing at the bare cable which hung there invitingly. I pulled into traffic carefully and yanked at the cable. It was a less than smooth power delivery, as the bike bucked under my cable pulling, but it did work. Once I got at a good position I just left it there and let the engine race as I also shifted through a couple gears to get up to speed. So there I was, one hand on the bars, also doing the clutch and my other with my fingers slipping through the bare cable constantly, at up to 40mph. It was a wild ride home, which luckily was only three miles left when it broke. By chance I only had to stop at two lights, which left me grappling at the cable again to get the right tension and position each time. I felt very fortunate to make it home without further incident. The story will last for years though, and that’s what counts. This entry was posted in Motorcyling and tagged ADV, motorcycle hacks, throttle cable. Bookmark the permalink.